When local governments protect the people from Federal overreach, the local government shines. Likewise, when the Federal Government protects people from excesses of the state, the Federal Government shines. Darrien Hunt died at the hands of local police and there is sufficient cause to suspect race played a role in the shooting. This is a case that the FBI and Justice Department should investigate. News reports indicate that the fatal shooting was Darrien't second run in with the Saratoga Springs police. I suspect that the key to the shooting lies with the first run in. What has been reported is that Darrien was at a party with under-aged drinking and marijuana. There was a fight. Darrien was the only one arrested. 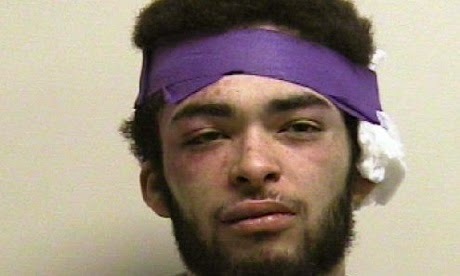 The mug shot shows that Darrien has bruises and a large bandage. Darrien pled guilty to child abuse in abeyance. The "in abeyance" plea means that it would be removed from his record if he went a year without being arrested. Darrien's aunt claims that Darrien was jumped at the party. So, imagine a situation where you are invited to a party. You are jumped at the party. You are the only one arrested and are charged with child abuse for attending the party. You would not feel good about the police. From a racial perspective, this first arrest looks suspect. There was a fight. The police arrest the black guy. The mug shot shows the black guy had bruises and lacerations. Later in the year, Darrien is out doing costume play. This is not uncommon in Utah Valley. Utah Valley [aka Happy Valley] sports multiple costume runs. It is home to the world's largest princess festival. It hosts multiple costume fun runs. The community held a record breaking scavenger hunt in the week of the shooting. White people walk around in this state with huge survivalist knives and with assault style weapons strapped to their back. Darrien is off playing by himself. While none of the white people in the world's largest scavenger hunt or at the world's largest princess party were reported as suspicious, Darrien was. Because of the abeyance ruling, Darrien was confronted with the reality that he would be in jail for the very serious crime of child abuse if the police arrested him. This brings me back to the first arrest. Darrien went to a party where he claims to have been jumped. He was the person arrested. The mug shot shows bruises and lacerations. A person who was beat up and arrested; he may have felt that running from police was his only option. I agree that the Justice Department should investigate this crime. The Justice Department should focus its attention on the first arrest and the court ruling that was holding Darrien in abeyance for child abuse at a party where he arguably was jumped and beaten. The fact that someone called the police on Darrien in a community where it is not unusual for white people to carry weapons or engage in costume play is a bit suspicious, but the area that needs investigation is the first arrest and the court ruling that held Darrien in abeyance of child abuse because marijuana was present at a party he attended.